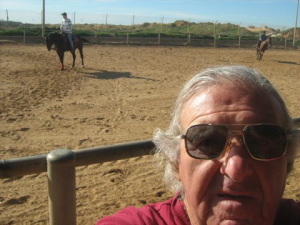 On my way to the original MyPoP the other morning to drink a coffee, I saw some horses with riders, from the nearby regular horseriding ranch. They were crossing the road, and heading into the bushes, from where they found a track down to the beach to amble back to the ranch. Further along the road I have also seen a sign showing a “horse head” and I took no notice, but this sign is not about the regular horse-ranch ?? (and I wondered?) I drank my coffee and afterwards decided to scoot on the road that I thought would be next to the horse trail. After a few hundred meters on the tarmac road..I came to a “soft sand” road and I saw another signboard with “horse head” and word “INTRA” ?. Usually I dont scoot on soft sand coz the wheels on my current scooter are small and thin and not designed for “offroad”. 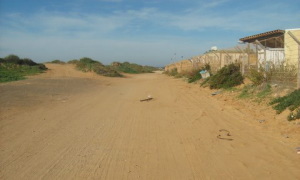 I decided to have a look anyway, and slowly scooted another few hundred meters on the soft sand. A couple of young women were riding, and working with horses in a closed area, and I learned from them..
briefly, that this is a place where horses are trained.. to accept *”handicapped riders”.. and “handicapped people” are taught to sit on and ride the horses. As soon as I heard that they use volunteers, I immediately became one. I am a “fixer, cleaner, do whatever” man.. and I go there often. Here, I learned that the word “*handicapped people” is regularly widely misused, and many people who are mentally or physically challenged, are NOT “handicapped”. 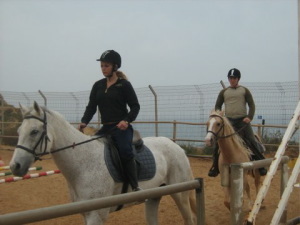 This “horse riding place” on top of the cliffs overlooking the Mediterranean Sea has become a second My PoP. This time it is “My Place of Patience”. 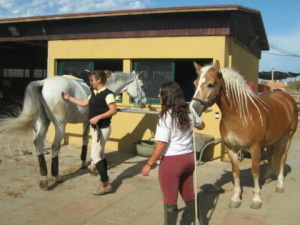 While I do some chores or just sit around, I have watched the trainers training the horses, and after a session, they groom and take care of the horses.. and their chores are ongoing and never-ending.. and they love what they do ! I have watched as these patient persons teach a rider..oh so many “things”.. about the saddle and other equipment, how to sit and hold the reins..how to do some grooming. This teaching, and the learning, are also ongoing and never-ending. Hats off to this incredible place, and as a side comment..I’m very happy that no smoking is allowed close to the horses. A smoking area is to one side..and that will be a pleasure for me to tell smokers to “move along”! I will be relating to you from here, and from time to time will tell about new things that I see and things that I’m told. So watch this space. On my way back home I stopped at a tiny kiosk where Ofer makes felafel in a pita bread..and another delicacy made with boiled eggs also in a pita. 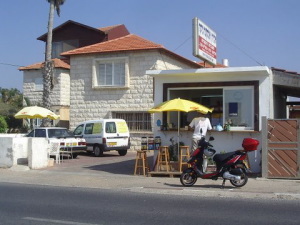 I say its the best in Israel..certainly the cleanest kitchen I’ve seen, all 3 meters x 3 meters square, and he has the necessary pots n pans n stove n fridge that he needs, and always a customer or two eating at the counter, which is across the road from the sea. I put up 1 finger on each hand and he knows I want 1 of each..to take away..and while I was waiting, I sat at the little table.. I looked at my scooter helmet on the saddle…and thought back to when I was 18 years old and living in Johannesburg.. and 55 years ago when I had my first Vespa scooter. NO helmets were necessary in those days, and the scooter also came with a spare wheel, and life was so different then. I used to park the scooter on the sidewalk, outside the building where I lived, and night after night NO one ever interfered with the scooter. I often scooted to The Dolls House and collect takeaway hamburgers and toasted cheese sandwiches. I dont remember ever feeling unsafe while scooting all over the places IN and outside the city. One day my friend Bob who also had a Vespa was involved in an accident, and a photo appeared in the newspaper with caption “scooter and wheelbarrow in accident” ! Bob said he didn’t see the wheelbarrow, and the pusher of the wheelbarrow said he didn’t see the scooter.. no serious damage..the matter was settled on the street..out of court. Another memory flashed back.. I belonged to the Vespa Scooter Club which had about 40 members, and we often went for outings in a group..maybe 20 scooters, and many of us carried a passenger, so perhaps 30 people on an outing..(usually one every month). I was club captain for one month which was a marvellous idea, so 12 captains in a year..who chose a route, and arranged with a restaurant or picnic place, that a group would be coming, and we always were welcome at these places. I’ll never forget when Dawn invited us to her home at the end of an outing..and about 20 people queued outside the one only toilet in her small apartment. In the tiny lounge 6 or 8 drank a coffee or colddrink, then moved outside so the next 6 or 8 could come in for their drink. I remember most drivers seemed to drive more carefully in those days, and many smiled and waved as they passed the scooters. My packet was ready, and I realise that since I began scooting here in Israel, I have asked perhaps twenty riders of 2 wheelers, to ride with me a while, and as yet none have. About 12 other riders have suggested to ride with me sometime.. but, NEVER yet have I had another rider to do a ride with me. I still ride alone. Perhaps if I had company on some trips then I wouldn’t have seen what I’ve seen, and probably wouldn’t have met some of the great characters that I’ve met along the way(s). Please dear reader.. dont forget to visit the two websites I mentioned earlier. Louis the Scooterer is a retired South African living in Netanya, Israel. NextNext post: Before you celebrate new year…. I really enjoyed your bit about the INTRA people. I watched the video and visited the website. Great stuff!! I think I had mentioned a while back that we have horses. We also have here in the US places that do the therapeutic training. It’s a wonderful thing they do. It’s great that you are volunteering to help there. Hey, if I were there, I would most certainly ride with you! Keep up the good work. Ride safe. Hi to my friend Earl in Wyoming.. Thanks for following me, and for your encouragement. Your comment gives me that extra “push” thats needed to get out and do something different. Yes I wish you would ride with me a while..in the meantime, I will do the scooting and you do the reading.